Norway's capital, Oslo, has only about 650,000 inhabitants, though in the whole metropolitan area (incl. Akershus county with 545,000 inh.) there are over a million. The city is very widespread on both sides of the Oslo-Fjord and throughout the surrounding hills. 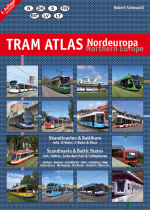 Besides the T-Bane, Oslo also has a large tram system (Trikken). 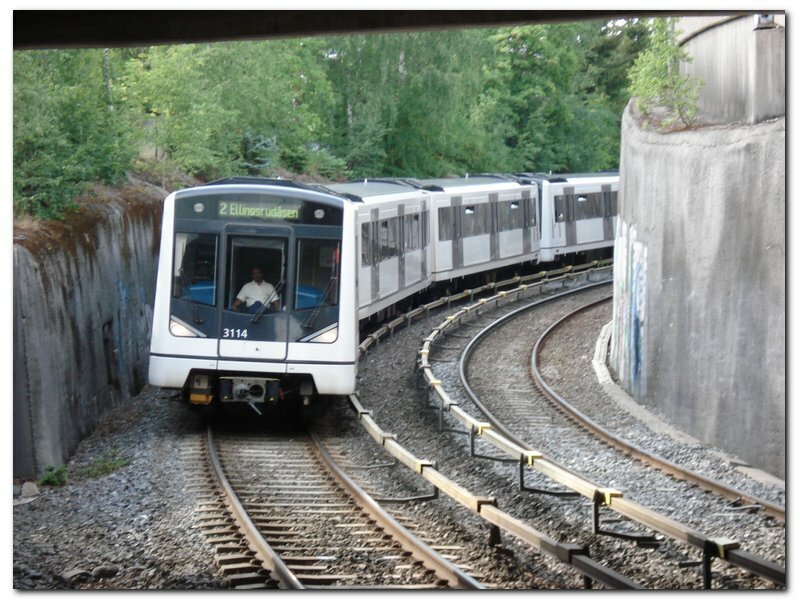 The Oslo tunnelbane began as a network of suburban railroads which finally were connected through a city tunnel to form today's network of T-bane lines. So some lines date back to the end of the 19th century (Holmenkollbanen 1898). All western lines had their terminus station at Majorstuen until a 2 km long tunnel was built to Nationaltheatret in 1928. On the eastern side of town, tramways dominated until the 1950's, there was only one rail-line (today's line 3 east). Line 4 to Bergkrystallen was opened as a metro line in 1966 although part of the line had been used for light rail before. In the 1970's the rest of the eastern lines was built with their city terminus at Jernbanetorget (Central Station). In 1977 the city tunnel could be opened for the eastern lines to reach Stortinget, in 1986 also western lines could run through the new tunnel from Nationaltheatret to Stortinget although passengers had to transfer here because of two different supply systems (only the eastern lines had third rail supply then). 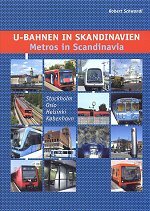 From 1993 on, the western lines either changed their power supply to third rail or new trains equipped with both systems (catenary and 3rd rail) have been used on Line 1 (2-car trains, switch at Frøen) and the former Line 4 to Kolsås (3-car trains, switch at Montebello). By 2014, all branches had been rebuilt with a third-rail power supply, although on the Holmenkollbanen many level crossings remain. 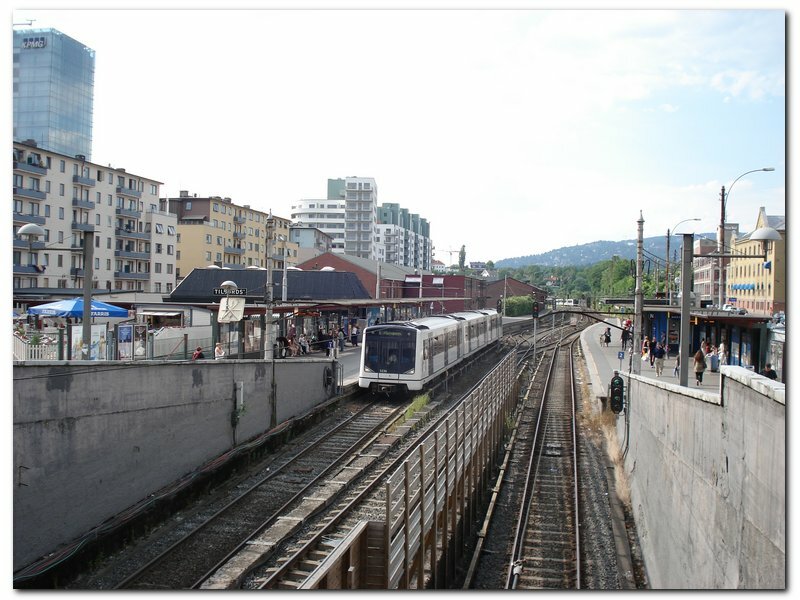 Since 1995, all lines have run through the shared metro tunnel from east to west. 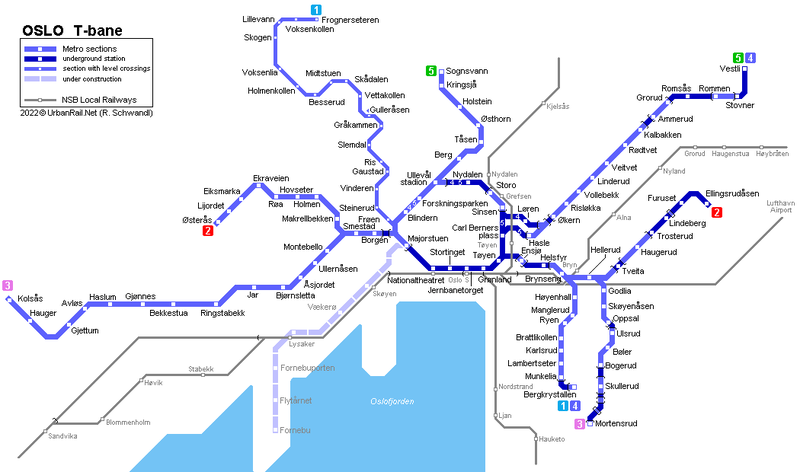 On 12 April 2003, the line arrangement on the western side was changed, with Line 1 being cut back to Majorstuen (during peak hours through operation to Bergkrystallen). 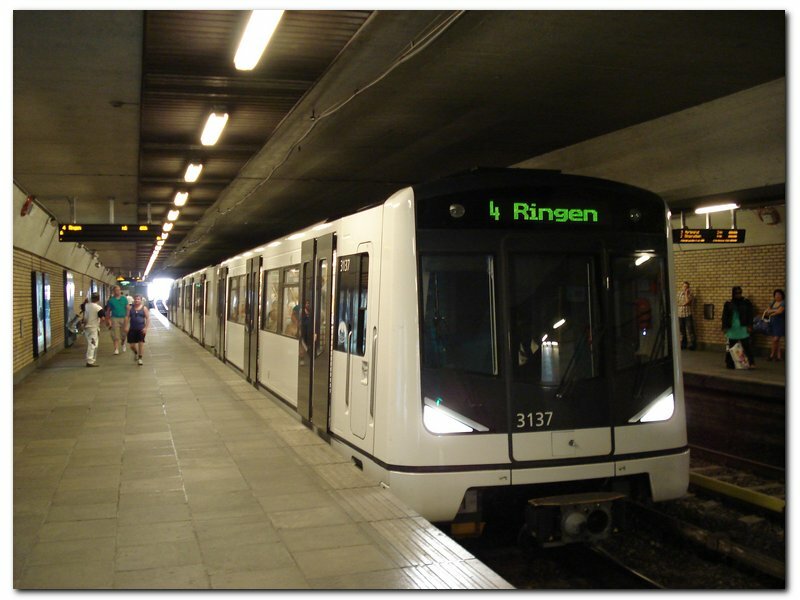 After passenger protests, Line 1 has been running again through the city tunnel all the way to Helsfyr since 8 Jan 2005. 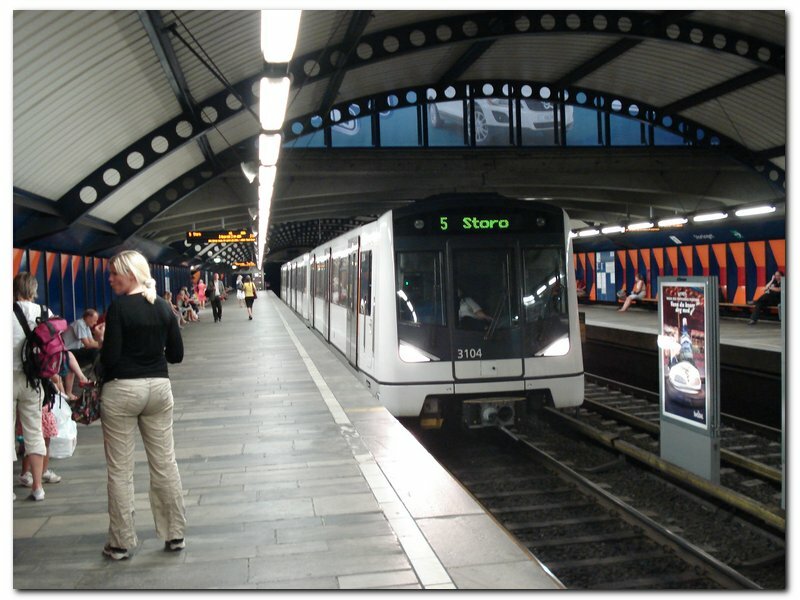 The ring line was completed on 21 Aug 2006 when the missing section between Storo and Carl Berners plass was brought into service. Since that day, Line 4 and the newly created Line 6 have been serving the ring jointly in a loop. 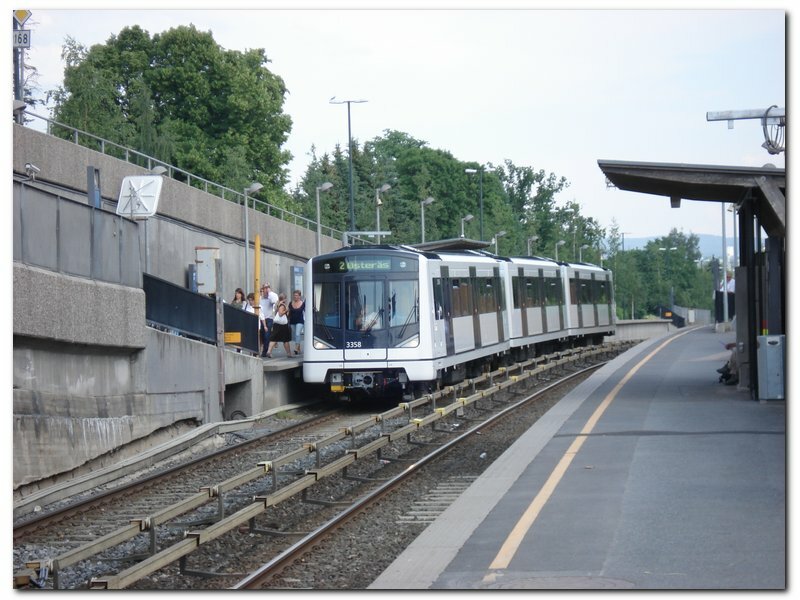 On 1 July 2006, the Kolsåsbanen was curtailed at Montebello station to allow for its upgrading to metro standard. During construction trains terminated at a temporary stop called Husebybakken. 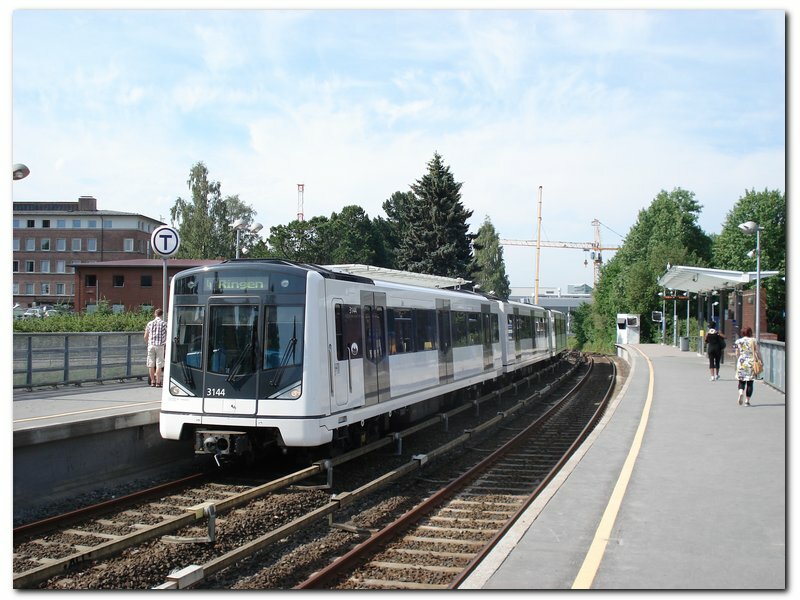 The line reopened in stages, starting in Aug 2008 up to Åsjordet and with the full line back in service since October 2014. On 14 March 2010, operation with overhead power supply ceased on the last stretch of line 1, which was then converted to third-rail power supply, too, although the line is not completely segregated, but retains several level crossings. While not all stations have been rebuilt (some may be eliminated or relocated), the doors of the last car of a 3-car train will not open at those stations. 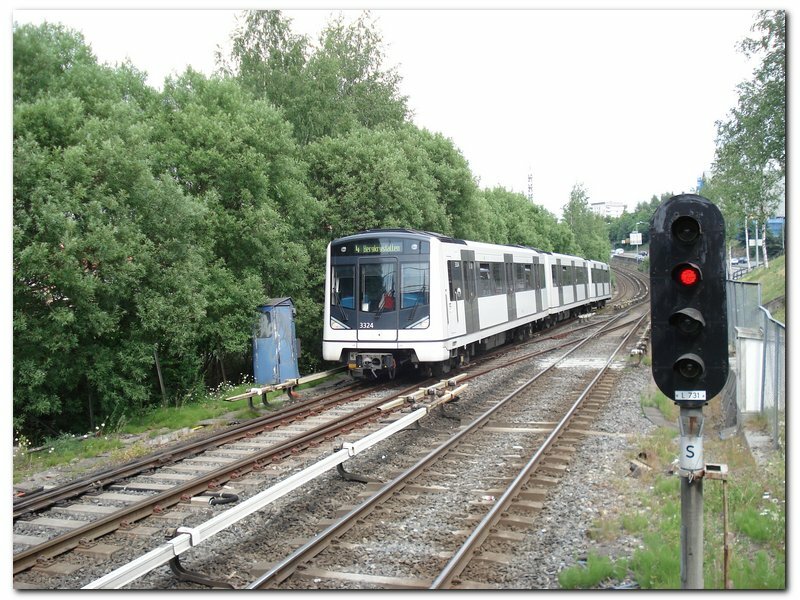 During daytime hours, line 1 trains now operate to Ellingsrudåsen, whereas during other times they terminate at Helsfyr. 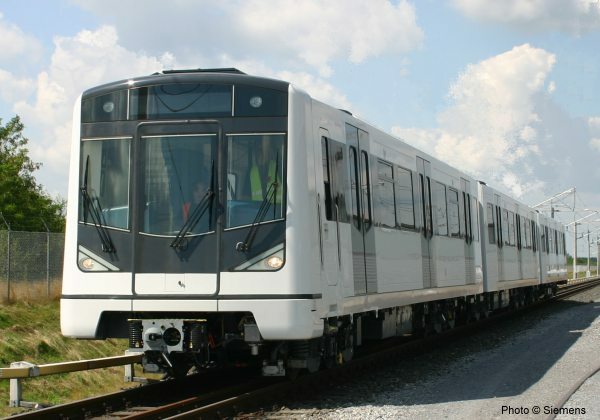 In summer 2003, 99 new metro-cars were ordered from Siemens (based on those built for the Vienna U-Bahn), with delivery having started in 2006. Three of these new cars will form a permanently coupled unit, allowing free movement between them. The new trains have replaced all older rolling stock. For detailed history click here! 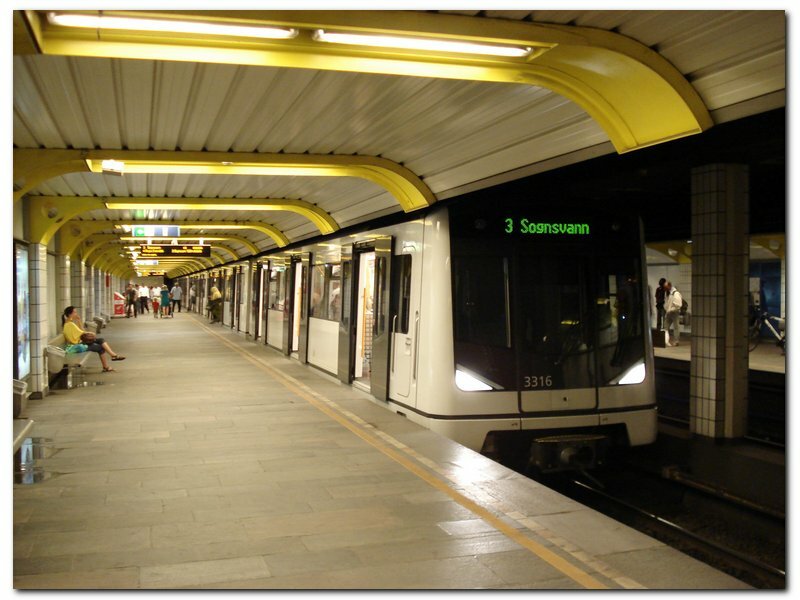 - in the city centre, an additional station has been planned at Homansbyen (between Majorstuen and Nationaltheatret) for many years, but postponed time and again. In the end it may be built in conjunction with a second city tunnel.